Italy’s biggest and best gran fondo took 9,000 riders from 37 countries around the spectacular course – all of them following our very own Jamie Burrow who won the event. Close to 250 riders from Britain and Ireland, most of them under the banner of Cycling Weekly, braved the giant passes of the Dolomites on what was for most a glorious, clear day. Only some of the last riders on the long course got caught in an isolated electric storm yet some seemed to enjoy it. Alongside the CW team there were many celebrities and ex-pros that filled the three-times oversubscribed event. This year it was possible to take a spin the day before the event with Fausto Pinarello, DJ Linus, Maria Canins, Fabrizio Ravanelli and superbike champion Troy Bayliss. Starting at 6.30am after the obligatory Italian honey and pasta breakfast, cyclists were treated to the sun glistening off the mountains and a tense vibe stirring as the television helicopters loomed above and bands blared out music. There are three courses on the Maratona and uniquely cyclists don’t have to decide beforehand which they are going to do. 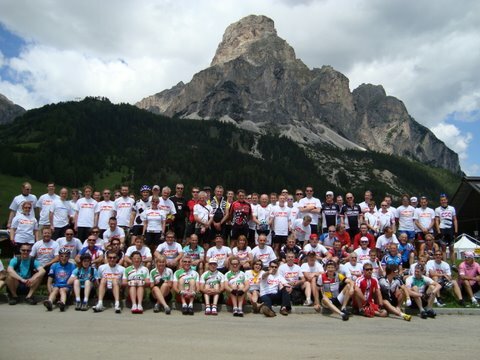 Everybody does the first four passes – Campolongo, Pordoi, Sella and Gardena – covering 55 kilometres and 1,780 metres of climbing to complete the short course. The second climb, Pordoi, was the most spectacular as cyclists could see the road snaking ahead of them full of bobbing heads. Some liked to clock the number of bends and count them down as they turn, 33 in this case. If cyclists still had the legs to continue up the Campolongo for a second time, they were then taken in a different direction from the short course to speed along the only long, flat section of the course, taking in the incredible beauty of the valley before the 10 kilometre climb of the Passo Falzarego. A short way up the Falzarego it was decision time. Some cyclists continued up and did the middle course of 106 kilometres and a total of 3,090 uphill metres, while hardy souls turned off to tackle the mighty Giao and the full 138 kilometres of the Maratona with 4,190 metres of ascent. Those who took on the Giao described by one rider as ‘an unrelenting monster to be tackled only by the boldest’ then ascended the Falzarego from the opposite side where both groups merged to take on the short, but painful by now, Passo Valporola. There was a general consensus that the Valporola was mentally the most difficult climb. It was only a couple of kilometres long and the gradient shallow, but everyone agreed it’s a sting in the tail after the massive challenges that have gone before. Entry into the Maratona DLes Dolomites is by online lottery in October. This year over 23,000 applications were received for the 9,000 places. Cycling Weekly has built up a sound relationship with the event and have guaranteed places. All food on the day, a top quality cycling top, a CW T-shirt and other goodies are included in the entry. For details on how to enter through CW send an email to wdcyclesport@hotmail.com or check the website on September 31. The race started at 6.30am and you needed to be in your start pen about a quarter of an hour before that. This meant an uncomfortably early breakfast for me. Once I got near the start village there were teams of volunteers looking at the number on my bike and directing me into my pen. The excitement and anticipation built as bands played, helicopters buzzed and TV crew were walking around. It really was breathtaking and got the hairs on the back of my neck standing to attention. Michil Costa the president of the event was hoisted above the crowd by an enormous crane to address the riders and a priest accompanying him blessed everyone. Michil was then lowered to mount his massive penny farthing to lead the pros over the line. It took a little while to cross the start line and it was a bit frantic as riders jostled for position, some even used the pavements or grass verges to get past. But by the time we reached Campolongo the climb helped to seed the riders well. It was a good first climb – not too difficult after the first half a dozen hairpins – and set me up nicely for what was to come. Once I approached the summit and looked back down at the landscape and the thousands still winding their way up, the sense of achievement at what I’ve just climbed filled me full of confidence and spurred me on to the next climb. The descent of the Gardena was an absolute delight. Technical bends open out about two thirds of the way down and high speeds were reached as I rolled into Corvara and the end of the short course. The feed station at the top of Campolongo the second time round was very popular. Following the descent of the Campolongo, it was a very fast, slightly downhill, section of the ride. A long line of riders flew along at around 50kph. A short way up the sixth climb, the Falzarego, I really needed to assess my capabilities, mental state and pain threshold. The sense of achievement I felt after the Pordoi pales into insignificance when I’d reached the top of Giau.